It's a great article but most pro's around here say you Don't want to use Latex admix in your mud, just water. Read why. Additionally, we advise DIY'ers to use Deck Mud instead of Mortar Mix. Deck Mud is easier to work with. Mortar Mix, like Harry uses in this article, contains lime. Lime makes the mortar sticky but harder to work with. It's use is not necessary. Keep it simple and use Our mud recipe. The two methods of shower building I employ do not require that the pan be notched into the studs. In the mud method the pan is embedded in mortar, and with the Kerdi method, the membrane is placed on top of the mud. When building a CBU shower, you should notch the studs to make room for the thickness and folds of the liner. -- J.B.
9/17/2013 - Link no longer working. Web site no longer online. Google Instant-Set cast iron shower drain if interested. We've had a lot of questions concerning the thickness of the mortar bed at the drain, or how much mud you should have above the membrane. The consensus around here is that the minimum height of mortar at the drain should be 1- 1/4 inches. More certainly doesn't hurt. This means that if your pre-slope (the mortar beneath the membrane) is sloped consistently at 1/4 in. per foot of run, your final bed will be consistent in thickness from the drain to the wall. We need the minimum of one and one-quarter inches to offer enough mass to hold the bed together. Further, I know of very few tile setters who install lath or other wire reinforcing in the final mortar bed as shown in the drawing. You don't need it. You do need lath or other reinforcing in the pre-slope when going over a wood floor. For a concrete subfloor the lath is omitted. The pre-slope mortar is instead bonded to the concrete with thin set mortar applied to the slab just prior to dumping the mud. Last edited by John Bridge; 08-29-2004 at 11:03 AM. OATEY Product Number:42213 is the 2" or 3" PVC drain with stainless steel strainer. This is the style Shower Floor Drain intended for use with a vinyl pan liner and is available in plastic (PVC) or cast iron. The Bottom Flange connects to the trap or trap riser and sits on the subfloor where it should be securely fastened. The surface of the Bottom Flange should then be temporarily covered with duct tape. The duct tape is removed and the vinyl pan liner is installed over the bottom flange with a hole cut through the liner no larger than the size of the drain hole in the flange. It is also necessary to make additional cuts sufficient to expose the threaded bolt holes (3) in the Bottom Flange. A sealant is used to seal the bottom of the pan liner to the top surface of the Bottom Flange. The Top Flange then bolts to the Bottom Flange clamping the pan liner into place. It is the Top Flange which contains the weep grooves. The bolts should be evenly tightened but not overly tight. The threaded Drain Cup then screws into the Top Flange where the threads allow for final height adjustment and positioning of the Strainer Cover. The height to which the Strainer Cover is set then determines the final height of the sloping concrete subfloor. It is however very important to remember that the concrete should actually stop below the surface of the Strainer a distance equal to the thickness of the floor tile plus the thinset to be used. This will result in the surface of the finish shower floor tile being flush with the Strainer. 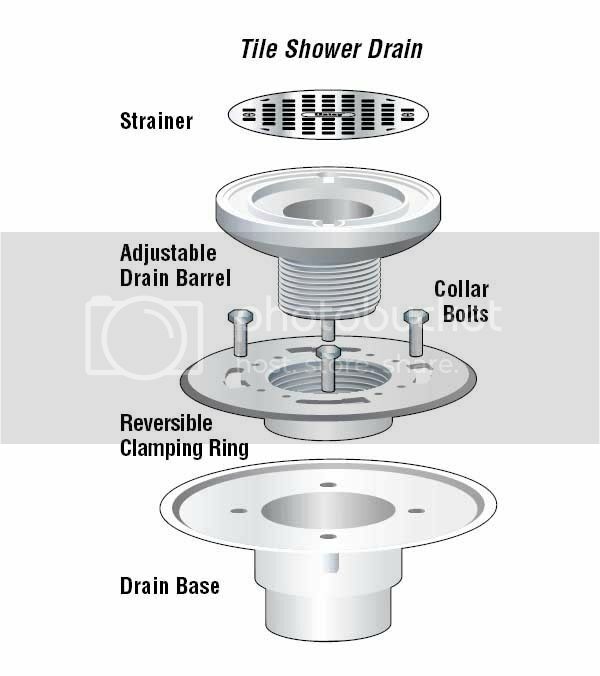 This style of shower floor drain should be available at all plumbing supply and home center stores. Last edited by Mike2; 08-05-2008 at 03:35 PM. Everyone is familiar with the classic soap dishes and shampoo shelves that have been in showers and tub surrounds forever. These accessories should be considered in addition to all the other details you must think of when designing and planning your new shower or tub surround. Soap dishes are inexpensive and can be located anywhere within the tile layout you choose. They don't have to be centered unless of course that's how you want them. Nosiree! Sometimes it is more convenient to place a soap dish forward of center in your tub surround for easy access while sitting in the tub. Or maybe a second soap dish on the back wall to make it easy on you when giving the kids a bath, shorter reach you know. An additional soap dish can be located in the front wall of your shower/tub surround somewhere below the showers spray head for stand-up convenience. The same goes for shampoo shelves, but they do sometimes cost a little more than a soap dish. Place them where they are convenient for you. Most shampoo shelves are corner shelves however, and that pretty well tells you (almost) where they must be installed. The height however is up to you. Think of your own personal convenience. Traditionally soap dishes and shampoo shelves are set into the tile as you make your installation. These accessories are however available in a style that will clip-on after the tile is installed. This style requires you to drill holes in your tile, place plastic anchors, attach a clip, then slide the accessory into the clip. Finally the appropriate caulk should be used to seal the installation and finish the appearance. No one can tell they are clip-ons. In addition to these manufactured accessories, you also have the option of using maybe a large piece of marble or granite tile, or a piece of solid surfacing material such as Corian. These items can be cut to a triangular shape and installed at the same time the tile is installed with minimum effort. Solid surfacing material comes in every color you can imagine and can make a great color accent if you choose. Keep in mind that this type of homemade shelf should slope slightly (try saying that five times real fast) towards the shower or tub so that water does not stand in the corner atop the shelf. There is yet another method of installing soap dishes and shampoo shelves available to you when designing your tub/shower accessories and their locations. These things (Niches) are incredible little creatures. They have always been known to me as "recessed soap dishes" and "recessed shampoo shelves". It wasn't until I stumbled into John Bridge.com one day that I realized these things were also called "niches". And of course I had to ask, I couldn't wait and figure it out on my own. The niches I'm referring to here are manufactured, modular if you will. Niches to me were always those things you saw in massive entries and hallways thay had statues in them. Usually scantily clad statues. Anyway, as time goes on I'll try to develope some sources for niches as I learn about where they are available. In the meantime, There is one company (WR Bonsal) that offers several niche module designs. These things must be installed when the shower or surround installation is just beginning. It is necessary to "block" between the studs (with 2X4's) to receive the niche, and this requires a little planning but it's really simple. Once the niche is installed with adhesive and/or screws, the wallboard can then be fit around the niche frame. That juncture is then sealed (waterproofed). The niches are then tiled along with the walls and become a beautiful and integral part of the overall design. Enough said, take a look at what WR Bonsal has to offer in the line of Niches. Chlorinated polyethelene (CPE) is a type of synthetic material, which is prepared from the substitution reaction of polyethelene and chlorine under the action of initiation. The product possesses good resistance to weather, aging and ozone, oil and most chemicals and has fire resistant properties. It is a good plastic modifier and is a special rubber with good comprehensive properties. When referred to in this forum it is usually the material a shower pan is composed of. Polyvinyl chloride, (PVC), is the product of combining ethylene (derived from petroleum, natural gas or coal) and chlorine (derived from salt). The resulting compound, ethylene dichloride, (EDC) is catalyzed to form a gas called vinyl chloride monomer (VCM). Polymerization of the VCM by one of three processes, suspension, emulsion or bulk-polymerization, results in a fine-grained, white powder or resin, known as PVC or "vinyl" . In order to add unique physical characteristics to the vinyl, plasticizers, or phthalates, are added that may give the material such properties as flexibility, fire and impact resistance, and color. Processing of vinyl for end-use applications includes extruding (pipe and cable), injection molding (three-dimensional parts like valves), calendering (film and sheet goods), and dispersion molding (such as coatings for carpet backing and floor tiles). The fact that PVC is relatively inexpensive to manufacture and is adaptable to many applications accounts for the construction industry being the chief beneficiary of PVC production. Last edited by davem; 03-04-2003 at 08:15 AM. There is a company taking great strides in the manufacture of shower benches and shelves. The INNOVIS CORPORATION is the creator of a product called the BETTER BENCH. I have personally been using these benches for several years and would highly recommend them for both new shower construction and post shower installations. Innovis offers both benches and shelves, take a look at their website and see what you think. DIY friendly. They also have plans to introduce a prefabricated niche that is tile-ready and requires no in wall blocking. This may still be a secret so don't say anything to anyone just yet. They didn't tell me not to talk about it but they did send me a unit to peruse and appraise. So far I see a very promising future for the Innovis Niche also. Last edited by davem; 03-04-2003 at 08:36 AM. What kind of wire mesh in top layer of mud? Q. 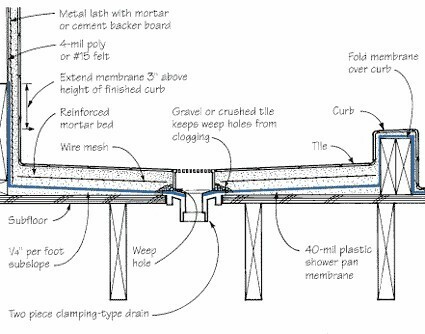 What type of wire mesh is recommended for the final mud floor? My answer would be 2x2 galvanized mesh. I have had some 2.5 suspended in floors that cut the mud right in half. Granted, the traffic was a little early. I would not use metal lath. As Dave G. points out, it can actually weaken your floor by dividing it into two strata. My good friend Michael Byrne recommends 2x2 reinfrorcing mesh, which is hard for a novice to find. I recommend nothing, unless your shower is super huge. 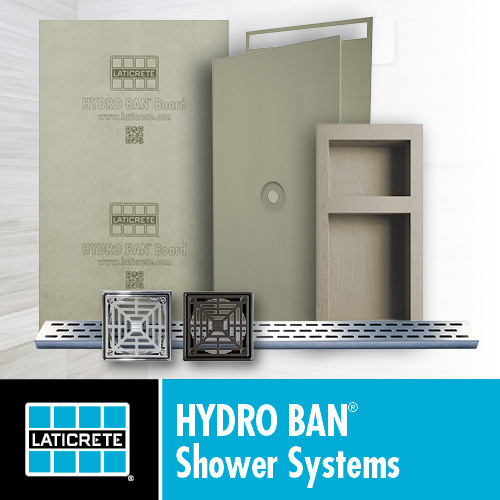 Update: The ANSI standards (A108.1A, section 2.3.5) no longer require reinforcing wire in the top mud bed of a traditional shower receptor unless the shower floor is larger than 65 square feet. Last edited by cx; 02-10-2016 at 05:41 PM. I've moved David Taylor's article on the Kerdi Shower to the Tile Your World web site. Last edited by John Bridge; 02-14-2004 at 01:56 PM. Installing grab bars and handicap bars seem to be one of those issues that gets passed over.I dont need one now or you just dont consider it to be a requirement at this time in your life. Consider this carefully.grab bars and handicap bars are the one thing we will probobly all need one day and if you consider what the life of your shower installation is,then perhaps a little groundwork isnt out of line.afterall,a few minutes today may save you a multitude of hours (or days) when you no longer have the energy or extra income.All this can be avoided by installing blocking in the form of 2x10's now.consider where you would install a bar one day.Perhaps a couple of differant area's. An upright or vertical bar to help in entering the shower area is popular as is the horizontal bar along a side wall. A few dollars and a few minutes make the installation an easy addition.With the blocking in place you can install those bars anytime you feel the need. Remember to write down the measurements you installed the blocking at.Perhaps taping it to the bottom of a vanity drawer for future referance will keep it from dissapearing. Its this kind of forthought that will one day pay dividends and make you once again proud of what you accomplished when you took on your shower project. Leme give you the wisdom of my direct experience. I am not a full time tile guy, just a dumb remudler, so take this with a grain of salt. About 5-6 years ago, I read Michael Byrne's book and noticed that he recommend using Acrylic Ad Mix to make the mud stronger and harder. Wow, OK, having a 3600 psi mud floor made sense to me. I posted something here and John chimes in and says that his mix is sandy and he doubted that any of his floors are much above 1800 psi. OK, I thought, he's some hick from Texas what does he know. I've read MB's book, and well, I know better. OK, so I fire my tile subs and try my first floor. I make the mix rich like you wanna do, and to boot, throw in some Ad-Mix. This baby is going to be 4800 psi and we can drive a car across it, OK? I am feeling really good here, OK? I float the floor and the first thing I notice is that the mud is sticky, and clings to the strike off (straight edge), so I switch to aluminum and it still clings. No big deal, I say. I also notice that because it is sticky I am getting some humps and dips that just won't strike off. The mud clings together and it is like trying to sculpt with Jello, OK? Thats OK I say, I am still a tile stud. Well, the floor dries and what a mess. The humps are rock hard. Yep, 4800 psi. You couldn't shave them off without a frigging jack hammer. So I have to chisel out the humps and fill in the dips, and spend a solid day fixing up the floor, and it still wasn't very flat, so Level Quick and Quick Fix was the ticket. Ugh. I felt really stupid, and was. So what you want is very counter intuitive--a sandy loose floor that is fairly soft. It will be flatter because the mud won't cling like Jello. If, God forbid, there are humps, you can shave them off the next day with a flat trowel, not a frigging jack hammer. Dips are easily taken care of with some thinset or QuickFix. Well I'm on the program now. I threw away the Ad-Mix and now am on the 5-1 program. More sand, less porland. Less is more. Actually the pre-bagged stuff at the masonry store or DalTile is great. Probably 5 or 6 to one, because sand is cheaper than Portland. I am now a recovering Ad-Mix Portland holic. Last edited by davem; 09-17-2005 at 08:04 PM. Studs in a CBU shower must notched to accommodate the thickness of the liner. Otherwise the CBU will bulge out at the bottom leading to complications when setting the tile. That notch should be about ¼” deep at the corner where the liner will be folded. Elsewhere around the perimeter of the shower, 1/8” is fine. Notching the sole plate will not be necessary. Backing blocks between the studs are then placed flush with the notched surface. Notching is much easier to do of course with a saw before the studs are framed in place. However, existing studs can be notched in place with a large wood chisel. 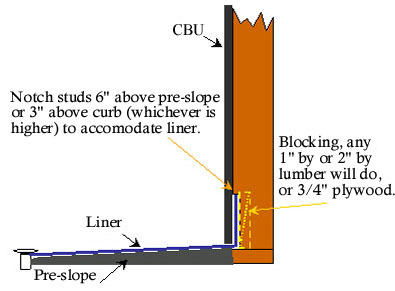 How far up the stud to notch is really governed by the height of the curb. You'll want to extend the liner a minimum of 6 inches above the surface of the pre-slope or 3 inches above the curb, whichever is higher. An alternative to notching is the use of furring strips. If you decide to use this method, think it through as this can lead to complications. This is especially true when the wall of a shower space continues on, without separation, into an adjacent space. Generally you’ll end up having to place furring strips along the entire wall and in some cases relocating fixtures, like a toilet, to obtain adequate clearances. Here's a great thread created by Davestone, one of our moderators, on how he builds soap shelfs using natural stone.